And when he had fasted forty days and forty nights, he was afterwards hungry--MATT. iv. 2. Every Portion of the history of our Divine Redeemer was intended to convey important lessons to His followers. The Church continually points at His example, and so distributes and adapts in her office the several incidents of His life, as to make them bear, as her instructions vary, on the particular lesson, which she is desirous of teaching. At the commencement of the present holy season, when penance is her theme, she selects for our contemplation, the penitential exercise, which He underwent, previously to the opening of His mission; when retiring, as you have just heard in the gospel, to a distance from the society of men, He subjected Himself to a severe and uninterrupted fast, during the space of forty days. At the conclusion of this protracted abstinence, exhausted nature demanded support, and this was the moment, which he selected for confounding the insidious tempter of man. Entering then into the views of the Church, we cannot do better, on the present, occasion, than fix our eyes on the instructive spectacle, with which we are presented, and endeavour to learn, in this great example, what the obligation is, what the titles are, by which we ourselves are bound to the practice of penance. Our Saviour fasts as man. In the long privation of sustinance which he endured, a miraculous power preserved indeed his existence, but did not prevent him from feeling the pains and inconvenience arising from His austerities. And when He had fasted forty days and forty nights, He was afterwards hungry. He fasts as our model and our head. Being about to inculcate the necessity of works of mortification, he would excite and animate His followers to the performance of this duty, by His own sacred example. He fasts as one charged with the expiation of the sins of men. Having come from heaven in quality of our Redeemer, He offers up to His eternal Father this long and severe maceration of His flesh as part of His atonement. On an attentive consideration of these three characters, which our Lord here assumes, we shall find ample matter for instruction; inasmuch as they point out the triple obligation, which we all incur, of practising the virtue of mortification, as men, as christians, and as sinners. A few reflections on this three-fold obligation shall form the matter of my present discourse. In the first place, then, my brethren, as men, as the offspring of a corrupted stock, self-denial is indispensably necessary for us. No sooner did our first parents transgress the divine command than labours and sufferings were declared to be their inseparable lot. Their descendants, born in pangs and in sorrow, were to eat their bread in the sweat of their brow: the earth was to yield them thorns and briars; and all nature was in some measure to disclaim the sovereignty of its fallen lord. But, if the effects of man's disobedience were thus widely felt in the objects around him, it was in his own breast, that his transgression occasioned the most baneful revolution. From that moment, a furious and interminable war arose within him. His inferior appetites, rebellious to reason, incessantly demanded gratification at the expence of duty. All the powers of his soul were corrupted and brutalized. His will became perverse, sluggish to good, impetuous to evil: his understanding was overclouded with error, his heart was elated with pride, his affections were either fixed and centered on himself, or chained and enslaved to the objects around him; virtue from that moment assumed, in his jaundiced eye, a repulsive aspect, and the service of his Creator, which in innocence had been his sweetest occupation, became in guilt an employment of toil and restraint. From this unhappy train of evils no one, of all the children of Adam, could in justice claim exemption. And it is not necessary for any one to go farther than his own heart, to witness these sad consequences of that first transgression. All have felt desires, which their better reason forbade them to gratify ; all have felt within themselves that domestic warfare, described by St. Paul; all have experienced the rebellion of the flesh, which lusteth against the spirit, and all might, with truth, apply to themselves those words of the Apostle, The good which I will, I do not, but the evil which I will not, that I do. Here, then, my brethren, from this fatal propensity to evil, we learn the necessity of the unsavoury doctrine of mortification. Here it is, that we meet with the apology for that holy anger, with which the saints of God have mortified the deeds of the flesh, by giving their bodies to fasting and austerities, their will to unreserved obedience, their whole lives to the severest exercise of penance. Here, in fine, we read the condemnation of the world, and of all its voluptuous maxims; the condemnation of its pleasures and its pastimes, its vanities and its excesses. Man, by sin, brought on himself all the miseries under which he groans; and as the inordinate propensities, to which he is subject, are the punishment of criminal indulgence, it is a duty incumbent on him in his fallen state, to meet and combat them by salutary restraints. 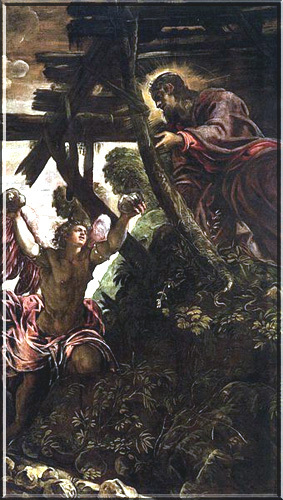 God, the sovereign Physician, in undertaking to cure, by His suffering, the deep-struck malady of original sin, has pointed out the antidote which He would have us employ, the means which we should make use of, if we would be enabled to counteract the pernicious consequences which sin has entailed. Reason herself declares the exercise of mortification to be that, by which the dignity of man's nature is best supported and secured; and to suffer and endure is a precept, in the practice of which, a celebrated sage of antiquity has placed the perfection of virtue. Indeed, my brethren, little will it avail you to have been restored to the dignity of children of God, if, by sensual gratifications, by a life of pleasure, softness and effeminacy you oppose the triumphs of divine grace, and keep an understanding with the mortal enemies of your souls. Believe me, every concession which you make to an inordinate appetite, adds to the clamours and impetuosity of the passions, lessens your power of resistance, and prepares the way to greater and more dangerous concessions. The lust of the flesh, the lust of the eyes, and the pride of life, can reign only in an unmortified soul. As a proof, examine for a moment the progress of depravity: interrogate the sinner, who has plunged the deepest into the sink of vice;--was it by some sudden revolution, by any instantaneous impulse of his passions, that he was hurried at once into all the lengths of criminal excess? Did the same day see him watchful, mortified, restraining all his irregular appetites, and then behold him sunk in guilty voluptuousness, a slave to all the base inclinations of his nature! Or was not his depravation rather the fruit of repeated concessions made to his sensual appetites? Did he not first enervate his heart, gradually weaken and undermine his own virtue by an unmortified life? Did he not, by habitual indulgence, add strength to his passions, and, by gratifying them in their less sinful demands, at length render them irresistible in those which were more criminal? Should such, unfortunately, be the line of conduct, which you have pursued, attempt not, when you fall, to palliate your enormities, under the plea of the weakness of nature, the strength of your passions, the fascinating power of that which seduced you; rather attribute your calamity to its real cause, to your neglect of the wholesome exercises of penance. By neglecting these, you have neglected the means of salvation, which God had placed within your reach; and if you have received death, it is from the venom of a serpent, which would not have harmed you, had you not fostered it within your bosom. But, alas! the generality of men consider these observances as duties incumbent indeed on persons in a retired or religious state, but wholly inapplicable to those, who take an active part on the theatre of the world. In opposition to this so fatal an error, I assert, that the practice of penance is, to persons in the world, above all others, of the most imperative obligation. The man of contemplation might possibly find, in the constant meditation of the truths of eternity, in the undisturbed application of his mind to prayer and celestial things, in the sacred and sublime occupations of his state, wherewith to combat his inordinate appetites. In the world, on the contrary, all things tend to excite and augment their violence. In the world, besides the evil propensities of nature, you have to struggle against the force of general example, against the seductions of pleasure, artfully decked out in its most attractive garb to enchant and captivate. There the passions are soothed and flattered; there virtue is without honour; there vicious indulgence, in almost all its shapes, is excused, in many is even applauded. In the world, then, the practice of self-denial is of the first necessity; there, if you are not mortified, your ruin is inevitable. And here, my brethren, allow me to mention an objection, not unfrequently brought forward against the duty, which we are now considering. Does God, it is urged, delight in the sufferings of His creatures? has He gifted us with a thirst for pleasure, which He intended never to be gratified? and is He, like some of the sanguinary idols of paganism, to be appeased by the blood and torments of his adorers? To obviate the futile and impious objection, we have only to recur to the origin of the duty of mortification, such as I have described it, to that domestic war, in which the sin of Adam has engaged all his posterity. Know, then, O man, that, if thou art subject to corrupt appetites, God is not the author of thy corruption: that He created thee for a happiness more real, more pure, and more exalted: that thy progenitor, by an abuse of his free-will, depraved and degraded that nature which he has transmitted to thee; that God, in imposing upon thee the duty of mortification, is but withholding thee from that, which would enslave, but would not content thee, is but elevating thy desires thither, where only thou canst find satisfaction and repose. After thy probation here, a new state of being awaits thee. There all thy desires, directed at length to their proper object, shall be satiated, thy longings for happiness completely gratified. I shall be satiated, says holy David, when Thy glory shall appear. From mortification, as the duty of men, we will next proceed to consider it as the duty of christians. A christian is defined by Tertullian, "one born to penance," and indeed, if, by assuming the name of christians, we rank ourselves as followers and imitators of Christ, no duty can be deemed of stricter obligation. The life of Christ, from its commencement to its close, was a continued series of privation and suffering. Poverty, exile, toil, abstinence, contempt, persecution; such are the prominent features in the history of this Man-God. But, not content with setting the example, he has enforced the doctrine of the cross by repeated precepts: He that would come after me, let him deny himself, and take up his cross and follow me. Take heed to yourselves, lest your hearts be overcome with gluttony and drunkenness. Unless you do penance, you shall all perish. The Church, the, faithful interpretress of the will of her divine Spouse, has in like manner always considered mortification as a duty incumbent on all her children. When, in baptism, she ranked us among the faithful, she signed us with the cross, as if to point out the standard, under which we engaged to combat. On that solemn occasion, before we were admitted to the benefits of redemption, we were required to declare perpetual war on satan and his auxiliaries. From that moment the mortification of the flesh, the subjugation of our passions, and the denial of our own will, became a duty from which we could not depart, without breaking the faith, which we then solemnly pledged to the Most High. From that moment, we engaged to follow Christ in the rugged path, which He had chosen; nor could we quit it, without leaving and dishonouring our model and our head. Yet, among those who make profession of christianity, how rarely do we meet with one, who properly acquits himself of this important duty. How many, on the contrary, are there, who might be classed with those, whom the Apostle designates with tears, as enemies of the cross of Christ, whose end is destruction: whose God is their belly, and whose glory is in their shame. How many are there, who, though again and again admonished, by their repeated falls, of the necessity of employing violence in subduing their inordinate inclinations, still shudder at the name of penance; still make the gratification of their appetites, the enjoyment of ease and of pleasure, the whole study of their lives? How many are there, who feel sad and sorrowful at the commencement of this holy time, for no other reason, but because it opposes a slight check to their accustomed round of diversions and enjoyments? Oh! my brethren, the heavenly kingdom, for which you are candidates, is not to be attained by the way of earthly gratifications. From the days of John the Baptist until now, says our divine Redeemer, the kingdom of heaven suffereth violence, and the violent bear it away. Every one, says St. Paul, taking allusion from the wrestlers and those that ran in the race, every one, that striveth for the mastery, refraineth himself from all things; and they indeed, that they may receive a corruptible crown, but we an incorruptible one. I therefore, continues the Apostle, so run, not as at an uncertainty; I so fight, not as one beating the air; but I chastise my body and bring it into subjection. If your conduct be in opposition to these sacred admonitions, pretend not to assume the name of christian. You have dishonoured the badge, deserted the standard of your chief: you have co-operated with His enemies, and have betrayed to them again the soul, which, at the price of His own blood, He had rescued from their yoke. You have, like Esau, bartered your birth-right for a sensual gratification. Act, then, no longer, the hypocritical part of marking your forehead with the emblem of Christ; rather throw off the mask, and at once openly declare, that you follow the party of his enemies. If the Lord be your God, follow him; but, Baal, then follow him. The third character, which I pointed out as rendering the severities of penance indispensable to us, was that of sinners. And here it is, my brethren, that this duty appears in all its weight and importance. On a certain occasion, when the disciples told our blessed Redeemer of the massacre of some Galileans, whom Pilate had ordered to be slain, whilst performing sacrifice,--an event which happened about the same time that a tower in Jerusalem fell down, and crushed to death eighteen persons,--our Saviour, who turned every circumstance to the advantage and instruction of his hearers, took occasion from these two incidents to call their attention to the just judgments of God, which were impending over them for their sins, and hence inferred the need, which they all had, of penance, in order to be saved. The individuals, he argued, who were thus suddenly cut off, were not greater sinners, than others who survived them; and if, by an inscrutable judgment of God, they were selected for punishment, their fate ought to serve as a warning to those who were in a state of equal, if not of greater, guilt. Think you, says he, that those Galileans were sinners above all the men of Galilee, because they suflered such things? I say to you no. But unless you do penance, you shall all likewise perish. Or those eighteen upon whom the tower fell in Siloe and slew them : think you that they also were debtors above all the men that dwell in Jerusalem? I tell you no. But unless you do penance, you shall all likewise perish. Applying, then, to yourselves, my dear brethren, this important instruction, delivered from the mouth of truth itself, and which was doubtless intended for you no less than for the Jews, consider, for a moment, what is passing around you. Every where do you witness the effects of God's inscrutable judgments. On every side do you behold your fellow-creatures pining in misery, affliction, sickness, and want. Here an unexpected stroke prostrates one from the number of your intimate acquaintances; there you see another long struggling under the severest sufferings, and finally falling under the hand of death. Yet are these, who by the severity of their lot seem marked and devoted in the decrees of an inscrutable but just providence, greater sinners than yourselves? Let your own consciences answer the question. Again; descend in imagination to the verge of the bottomless abyss, and view, in that place of indescribable woe, the punishments, with which an avenging God visits the violators of His law: then, if mortal sin ever defiled your soul, if in that abode of torments you can descry one, whose guilt is less heinous than your own, then, oh then, apply to yourselves in all their force, those words of our Divine Redeemer: unless you do penance, you likewise shall perish. In the order of God's justice, sin must be punished. Into heaven nothing defiled can enter. By sin your soul hath contracted a defilement, which can be cleansed only in the crucible of penitential suffering. Say not that your transgression has been forgiven in the sacrament of penance. You have, it is true, deposited your crime at the feet of your ghostly father; yet how can we believe it to have been with the perfect or even with the necessary dispositions? The sinner, who has truly repented, regards himself as his own greatest enemy; he rages with a holy indignation againt his own flesh; he treats it as a rebellious slave. He acts towards it as he would towards a domestic traitor, whom he cannot put away. Such is the true penitent. But as for you, does not that dread, that horror, that flight of mortification, and of everything that puts a restraint upon your appetites, seem to indicate, that you never really hated sin, that the enemy still holds you enslaved and shackled? But, let us suppose, that you have confessed as you ought; do you imagine, that, because you are freed from the eternal punishment of sin, you are freed also from the temporal punishment, which sin has entailed? That, while Christ is expiating your offences by a life of suffering and a death of ignominy, you may lead a life of ease and voluptuousness? Ah! let the severe rules, the penitential exercises imposed upon sin in in primitive fever convince you of the truth. Let the example of thousands of holy penitents, who punished slight offences by years spent in sighs and tears, and self-maceration, convince you of your error. So far from considering the pardon which they had received, as an exemption from penitential rigours, they only saw in it a stronger motive to punish and mortify that flesh, which had impelled them to offend so good and merciful a God. From this view of the subject, my brethren, it follows, that, if mortification be a duty incumbent upon all, it is more imperatively so on those, who have offended God by wilful sin. The moment that worst of evils gained entrance into your breast, from that moment a penitential life was the only means of securing your salvation. In vain, then, do you attempt to shelter yourselves from the severe precept, by alleging excuses of inconvenience, of necessity, of business, of health. The law of penance is as general as sin. The precept is universal. Unless you do penance, you shall all perish. Think not, therefore, that, because a peculiar combination of circumstances may exempt you from the specific observance of the law of fasting, you are thereby exempted from the obligation of penance. No! Your director may, for prudential reasons, have exonerated you from keeping to the letter of the church precept; but he has not, he cannot exonerate you from the obligation of punishing yourself for sin. In the hand of the Lord there is a cup of strong wine, full of mixture, the dregs thereof are not emptied: all the sinners of the earth shall drink. My brethren, from all that has been said, it follows, that the observance, to which you are now called, is not one of supererogation; it may not be practised or omitted at pleasure; it is an observance of absolute precept: one, on your fulfilment or neglect of which, nothing less than your eternal lot depends. Without the grace of God, no one can attain eternal life: in neglecting the practice of mortification, in giving way to sensual indulgence, in leading a life of softness, of pleasure and dissipation, you are directly opposing the influence of divine grace; you are throwing down the arms, which were given you for combat, and are placing yourselves defenceless in the power of your mortal enemies. As you value, then, your salvation, my dear friends, let your notions and conduct on this vital subject be, from this moment, reformed. Resolutely undertake the mortification of your sensual appetites, the conquest of your rebellious will, the destruction of the empire of self-love. Undertake it as men, lest indulgence should strengthen, and render irresistible those evil propensities, of which you are the inheritors. Undertake it as christians, lest you degrade that sacred character which you bear, and break the solemn engagements, into which you have entered. Undertake it as sinners, lest, by failing to satisfy the injured justice of God in the present life, you come to feel the weight of His indignation in the life to come. Let the holy season, on which we are entering, be to you the commencement of a new life. Courageously join with all the true children of the Church of God in declaring war upon the flesh and its concupiscences. If you are terrified at the prospect of privations and restraints, know, that God Himself will render the rough way of penance smooth and agreeable, in proportion as you advance. To animate yourself to the task, often extend your views beyond the present order of things. Often, in imagination, anticipate the moment, when you are to stand before the awful tribunal of an omniscient God: then, if you shall have deserved a favourable sentence, how pleasing will be the retrospect of the little crosses and momentary tribulations, by which you have purchased for yourselves above measure an exceeding weight of glory: but, should you unfortunately be cast at that momentous trial, how bitter the reflection, that for a few, fleeting, base, and deceitful gratifications, you have lost your title to eternal happiness, and incurred a condemnation to eternal woe.